All Toyota forklifts are manufactured with Toyota Genuine Forklift Parts and Toyota STARLIFT components. To maintain the highest levels of safety and quality, any replacement part used on a Toyota forklift should be a Toyota Genuine Part. Toyota parts have built a reputation for their high level of quality and durability people expect from Toyota. Don’t be fooled by imitators. 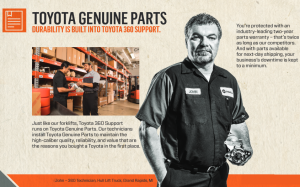 The only place to source Toyota Genuine Parts is an authorized Toyota forklift dealer.